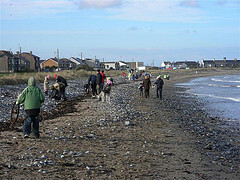 It’s a program started by Skerries News in June 2009, with the help of An Taisce, whereby volunteer families, schools, clubs and organisations can ‘own’ a stretch of beach for a year. They look after it and keep it litter free; Adopt a Beach provides the gloves, bags and support to help them do it. All adopters, or ‘beach guardians’, receive a Certificate of Adoption to keep.